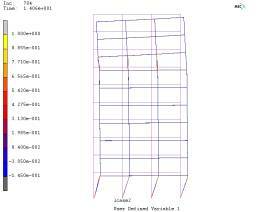 Fiber Model Program for Reinforced Concrete Frame. For the failure simulation of reinforced concrete frame due to flexural. Latest Version 27 is Uploaded! For MSC.MARC 2005 r2! THUFIBER STEP BY STEP TUTORIAL! THUFIBER for Reinforced Concrete Beam STEP by STEP! This program is free for education and research purpose. If you have used this program in your research, please mention it in the reference. The maximum project size of this program is 2000 elements. If you need a larger size version, please email to us: E-mail:luxinzheng@sina.com. If you have found any problem in the program, please notice us. Earthquake Research in Shanxi, 126(2), 2006, 7-11. Abstract: A fiber model for reinforced concrete (RC) structures (referred as THUFIBER) is developed, which is based on the general-purpose finite element package of MSC.Marc that carries significant capacity of solving nonlinear problems. In this model, the concrete and the reinforcement inside the structural elements are modeled respectively with different fibers so that the cyclic behavior of material can be properly simulated. Pushover and dynamic time-history analysis for a RC frame-tall building are carried out to illustrate the capacity of the proposed model. Earthquake Resistant Engineering and Retrofitting, 28(1), 2006. 18-24. ABSTRACT: To achieve better structural performance during earthquakes and to minimize rehabilitation and strengthening costs after seismic event is the main objective of the earthquake resistant design. With the invention of the high performance materials and their introduction to the structures, the failure mechanism and seismic performance, especially the residential deformation, can be improved seismic. The Passive Control RC Frame (PF) reinforced with high strength reinforcements in columns are investigated in this paper with nonlinear time history analysis method. It is found that the high strength reinforcements not only provides the RC frame more resistance against lateral earthquake loadings but also reduced the residual displacements after going through dynamic event. It is also seen that the use of high performance steel in columns can prevented the critical column base sections from yielding and totally eliminated the possibility of soft story failure mechanism. Moreover the strengthening and rehabilitation demands reduced and required only at the beam end sections. With the absence of total collapse mechanism it is envisaged that the use of PF would yield safer structures and the potential danger of complete demolition can be reduced.